On a sunny Tuesday morning, kindergarten students are sticking their tongues out and laughing. Rather than scolding them, their teacher is an active part of the fun: welcome to Lower School science at Forsyth Country Day School. “Our tongue!” one student replies. The human body is only the first subject covered in daily kindergarten science. 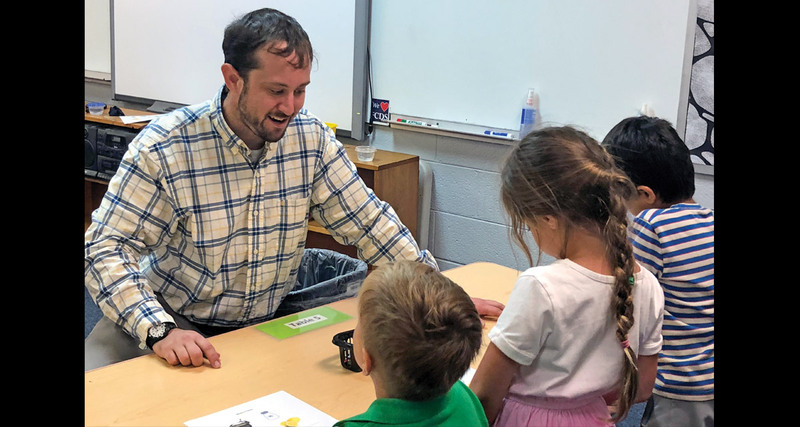 Students in Mr. Lough’s class also learn about how scientists work, animals and animal habitats (staying with the five vertebrate groups), plants, and finally, physics. Creative, hands-on activities help Mrs. Chance pave the way for learning serious science—and in many cases, she taps into character education by bringing in a service-learning component. For first grade’s study of plants and their life cycle, she introduced the “Lettuce Help” project. In early fall, students plant pots with lettuce. Once their crop has grown, the class harvests the lettuce and donates the produce to the Clemmons Food Pantry. Would your child enjoy the hands-on learning of science every day? Would you like to see our curious students and invested teachers in action? Schedule your tour at FCDS.org/page/admission/schedule-your-tour today!